Protesters in Montana have left a message for US President Donald Trump on top of a mountain visible from the site of his Thursday evening rally. 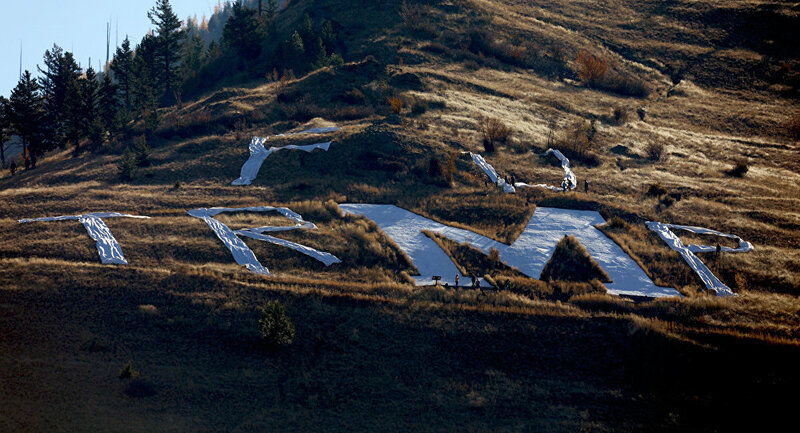 The message "LIAR" was written with 60-foot-tall red, white and blue letters on Mount Jumbo in Missoula, Montana, the accusation taking its color scheme from the American flag. The mountain already had a giant concrete "L" on it, signifying the Loyola Sacred Heart Catholic High School in the area. Protesters added the "IAR" to form their message to Trump. Google Maps image of the giant "L" on Mount Jumbo in Missoula, Montana. "We're accommodating him by being up here where people at the airport can see us," protester Roseanne Davis told the Missoulian. "We chose 'LIAR' because it felt like the strongest word," organizer Betty Tschudi said. "It's unbelievable how many times he lied and says things about people that aren't true. And we needed something that started with ‘l.'" On the opposite side of the mountain, protesters wrote "Dump Trump USA." Another banner in the city says "Children belong in concentration camps," a statement the banner attributes to Trump. On another mountain, protesters spelled out "F U Trump," using the letter M that was already there. Long lines for Trump's rally were recorded in the morning, many hours before it was set to start. While Republicans waited in line, liberal opponents of the president waited on the mountainside. "It seems right to sit on a sunlit mountain in our beautiful community on a gorgeous fall day to express our disgust with and rejection of Trump silently and bask in the company of others who share our voice and concerns and who need to be heard," the group that organized the protest said.